Okay, I have a confession to make. I AM OBSESSED WITH XANADU. I mean, seriously. I've seen the movie a million times, I saw the show on Broadway, I have both the movie and Broadway soundtracks and I LISTEN TO THEM ALL THE TIME. I can't get enough. I don't really know what it is, because honestly, the movie is pretty darn bad. But when you have the combination of Olivia Newton-John and Gene Kelly (or Kerry Butler and Cheyenne Jackson in the Broadway version), can you really go THAT wrong? Well, no. No you can't. Which is why, when I discovered Deborah Lippmann Xanadu, I was immediately hooked. I have a reason for not using this polish until now, though. I COULD NOT GET THIS BOTTLE OPEN!! No matter how hard I tried, how much hot water I ran over it, how I struggled with the cap, it just wouldn't turn. I've tried periodically over the years to change this, but nothing I did worked. Over the weekend, though, I was determined to finally open the bottle and finally use this gorgeous color. So I ran it under scalding hot water for a few minutes, took a dish towel and started turning the cap one way and the bottle the other. And miraculously, IT FINALLY OPENED! It must have been Xanadu's neon lights shining down on me. 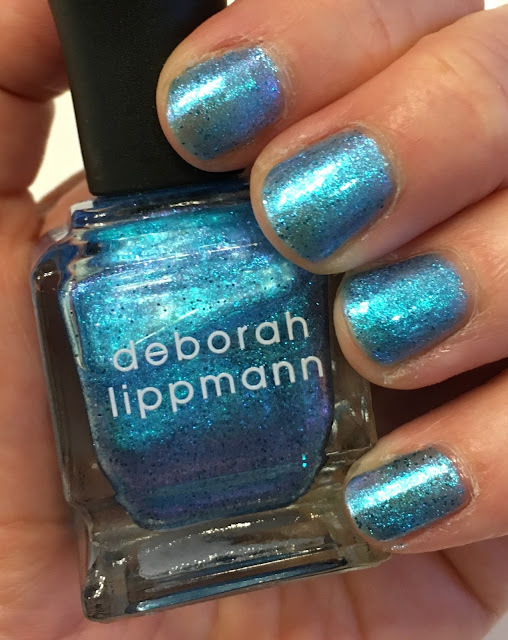 Have you ever seen anything so fantastical as Deborah Lippmann Xanadu? So let's talk about this gorgeous color, shall we? Have you ever seen a blue so beautiful? I am seriously obsessed. 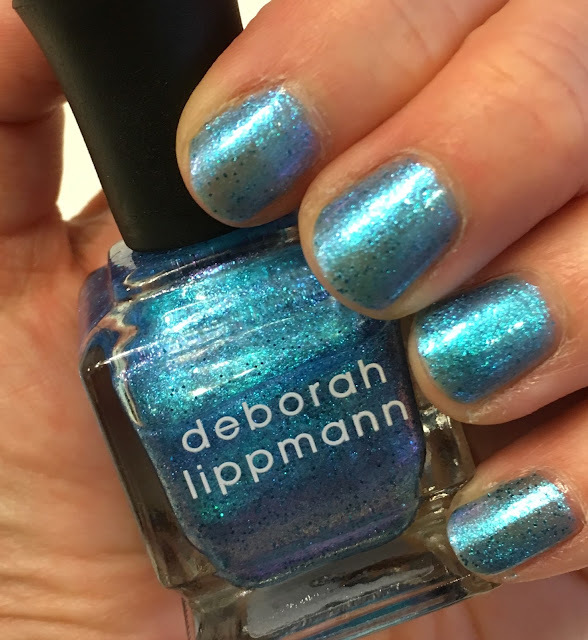 Deborah Lippmann describes it as a celestial cerulean, which is pretty on par. I am a huge fan of cerulean (maybe it's because of that scene in The Devil Wears Prada), but JUST LOOK AT THIS HUE. It shines, it glitters, it sparkles. The cerulean base is jam-packed with turquoise and pink glitter that gives it a holographic glow. Sometimes it looks blue, sometimes it looks pink, sometimes it's purple! Two coats made it completely opaque. And, even though it's a glitter polish, it's smooth instead of gritty. Basically, it's perfect. And now, I leave you with the video of the incomparably flawless Olivia Newton-John singing, what else, the title track from Xanadu ... because your neon lights will shine for you, Xanadu! Deborah Lippmann Xanadu retails for $20 at deborahlippmann.com. I completely understand your struggles with the bottle - I had to bin a whole tube of BeneTint because I couldn't get the lid open no matter what. I gave up on Benefit's lippies after that. What a pretty polish. It fits your personality perfectly too. I feel you on the long untried period! I'm glad you finally got that baby opened! This is so much fun! You should try it over a navy blue or black. It would give it a totally different look! I've never seen Xanadu, but this shade looks incredible! That's really pretty! I can't believe you couldn't get the bottle open for all that time. I think I would've tossed it. LOL! I pretty much watched this movie on repeat, along with Grease, when I was younger! I love how shimmery this is!